Somehow I always connected Masked Intruder with the movie The Usual Suspects. I’m aware that they are nothing alike. On the one side: Masked Intruder – the the socially troubled, romantically depraved, small-time burglar, and on the other Verbal Kint, aka Keyer Söze, the evil legendary crime lord. I guess the whole “criminal” thing is the only, if strong, connection. And then there’s the iconic movie poster. The five suspects lined up by police. Its a very nice visual for the entire film. It kinda asks to be re-created (and has been several times, as a quick google search will show). 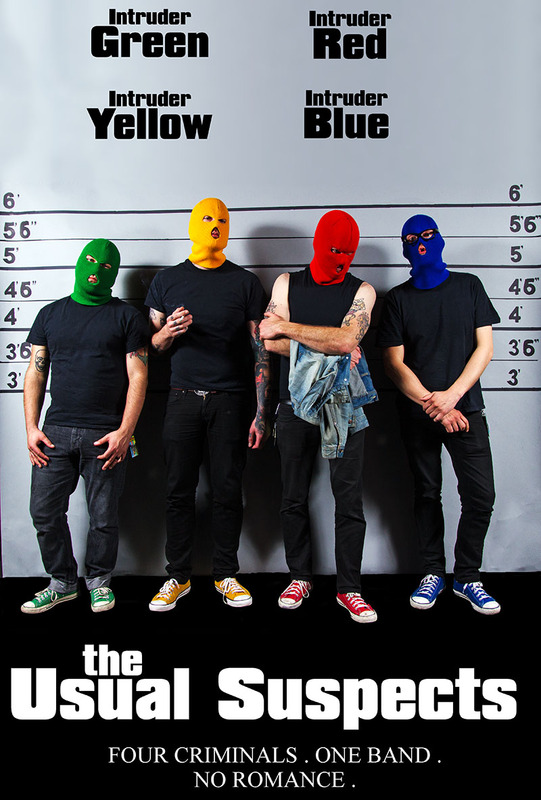 Anyways, I got an opportunity to do this with Masked Intruder. The key to this is the background. I had a roll of grey background paper from some other project lying around and thought I could make use of it. I ended up drawing lines and numbers on it for about two hours. And it would have taken longer if I had not had help from Verena. Thanks (x1000). Of course this wasn’t 100% flawless. The imperial measurements were confusing, and handling a 9 feet wide piece of paper in a room that is not that much bigger and full of stuff was its own challenge. And in the very end there was always the question if the damn thing would fit into the car after all. It literally fit. When I closed the trunk it couldn’t move anymore. Perfect size. My old pal Tilly accompanied me to the show/shoot, having to sit in the back cause the paper blocked the shotgun seat. After we got there we found the bands in the middle of soundcheck, room crowded with gear from four groups. Yet we found a corner to use. Set up the backdrop, the flashes, tell the band what the idea was. Talk briefly about poses. The promoter asked us to hurry up, so we just went for it. The final shots took about 2 minutes. Quick and dirty. But the result was very cool.